Tricolor Flooring is experienced in a variety of different flooring categories and floor construction. We provide prompt and friendly service, expert advice and guidance on flooring products and brands. We will help you select quality flooring that fits your decor, style and character of the room and your budget. 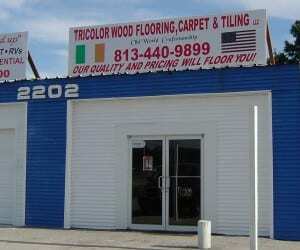 Tricolor Flooring specializes in all types of flooring from wood, carpet, laminate, vinyl, tile to stone flooring. We opened our Tricolor Flooring Showroom in Ruskin, Florida to provide the same valuable free consultation we previously gave to help our customers select quality flooring at the best prices possible. Tricolor Flooring uses its relationships with wholesalers and manufacturers for high-end and quality flooring to obtain a range of discounts from 10 % to 30 % depending on the brand and grade-specifications. Our showroom is the perfect place for you to get free advice and guidance about: design, construction and durability. We will work with you to realize your plans and give you the time to browse, examine and touch an assortment of different samples and ask questions. Also, we provide a shop in-home service and bring the flooring samples to your house to view in the room you intend change with new flooring. Our first step is to ensure you select the flooring you want at the best price possible. Sometimes the choices of quality flooring are overwhelming. We find choosing the right flooring is the most difficult part of the process that even though we provide assistance and guidance. At Tricolor Flooring Showroom, we have some control over the amount of discount we can offer our customers. In most cases, our profit margin on the flooring is razor thin, when you choose to have Tricolor Floor do the entire project. We offer a single Complete Package Price for the whole project that consists of the flooring you select, all construction materials and the complete labor to perform our famous expert installation. We have extensive experience and expertise in floor design, patterns, borders, sub-floor preparation, installation, repair, refinishing and renewals. We make it easy for our customers to save them time and money. Tricolor Flooring performs what we call a Double-Quality Job that’s composed of quality flooring and quality installation at a good discount. Our Master Craftsman installation services will evaluate the infrastructure by examining the the room in detail. For more information regarding our installation click on Tricolor Flooring Does The Whole Job. Tricolor Flooring gets flooring from wholesalers and manufacturers that we have a long term relationship. We buy our flooring at wholesale prices and add a small carrying charge and pass on large saving to our customers. Our flooring pricing is based on razor thin margins that is used to cover handling, administration and expenses. The results are big saving from 10% to 30% off retail prices on high grade and quality flooring. Our purpose is to handle your whole flooring project with excellence and make it extremely easy for customers to get their flooring project done as quickly as possible. Tricolor Flooring projects consist of selection, purchase, delivery and installation at one single reasonable price. We remove the middleman from the process. You save money with our single Complete Package Price that includes: the flooring you select, all construction materials and the installation. We will save you money because we have very little markup on our quality flooring and provide unsurpassed quality of installation services with the flooring product.